Ferrocerium rods let you start fires easily in a wide range of conditions. We’ve done hundreds of hours of research and testing on ferro rods, searching for the best ones for value, longevity, your budget, and portability. If you want to be able to start a fire in any situation, one of our ferro rod recommendations will do the job. What is a Ferrocerium Rod? Who Needs a Ferro Rod? The ferro rod that provided the best functionality, versatility, and value. Creates superheated sparks consistently. Includes a waterproof tinder holder and striker. 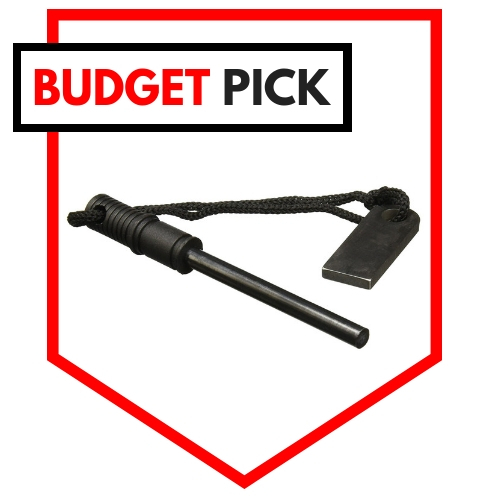 The Survival Hax Ferro Rod consists of a 6″ ferrocerium rod on a paracord lanyard with a multipurpose striker, waterproof tinder holder, and emergency whistle. That packs a lot of versatile functionality into a small package. It also only weighs 4 ounces. This makes it an excellent choice for bug out bags or other mobile survival kits. Extra thick 3/4″ diameter. 35,000 strikes at over 5,500 Fahrenheit. The Arcadia Fat Boy is no joke. It is the ferro rod’s ferro rod. At 3/4″ thick, you would be hard pressed to get to the end of the spark life with this one. Its massive size and width make it harder to misplace- which is pretty darn important. If you are looking for the biggest and best, Arcadia has you covered. A ferro rod for your budget. Cheap and practical. Gets the job done at a great value. The adage usually goes that ‘you get what you pay for.’ Well that happens to be exactly the case with the Schrade Ferro Rod– just minus the negative connotation. 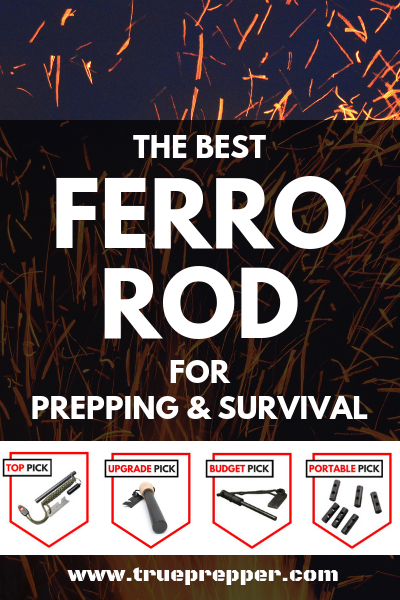 You’re paying for a ferro rod and you’re getting exactly that: a trusty ferro rod. It sparks well and does not pretend to be more than it is. A ferro rod for on-the-go. Light, small profile. Super-portable and great for mobile kits. Bayite Toggle Hole Ferro Rods are an awesome way to upgrade any equipment, pack, or clothing with drawstrings. These things thread onto anything with a string, or you could make a lanyard for them with paracord yourself. They let you take the power of hot ferro sparks wherever you want. You can even thread them on the laces of your boots. Let your imagination run wild with them and let every kit have a ferro rod! What, Exactly, is a Ferrocerium Rod? Ferrocerium is a synthetic alloy invented by a German scientist in 1903. A ferrocerium (abbreviated: ferro) rod is this synthetic alloy simply formed in a tube shape with one main purpose: to make sparks. And really hot sparks at that. Striking a ferro rod with a dense material produces sparks up to 6000 degrees Fahrenheit. Ferrocerium rods give us an elegantly simple solution for creating fire in tough environments. Militaries around the world have used ferro rods in survival kits, and you will find a ferro rod in almost any prepper or survivalists kits as one of their fire solutions. Carl Auer von Welsbach, the inventor of ferrocerium, was German and named it accordingly. A ferro rod is a far cry form a multitool, so it is pretty straightforward to use. It has one purpose. If you are getting the ferro rod out, you are looking to start a fire. If you need a refresher on fire starting in general, we have you covered with our fire starting guide. Ferro rods produce very hot sparks, so use common sense safety and supervise children. Don’t get down if you have some trouble: persistence and practice is key. It is also good to know that most ferro rods come with a black protective coating on the rod that must be scraped off to expose the alloy underneath. Ferro rods have a place in a many different types of survival and emergency kits. This last bullet point has some exciting options, as we pointed out earlier with our portable pick. EDC (Everyday Carry) is one of the easiest ways to stay prepared for any situation. Many times people have packs and bags with tons of functionality and versatile gear- only to get separated from them in an emergency. With an EDC strategy, you can avoid this pitfall. Ferro rods are typically lightweight and small to begin with, but when it comes to wearable items and being on the go, every ounce matters. This is where the wearable ferro rods really shine. Swap these bad boys out for your regular shoe or boot laces and you will always have four ferro rods with you. They are TSA compliant for the travelers out there, and very discrete. Having some fire laces in place of regular laces can provide some extra functionality with virtually no added weight. As a bonus, the laces on the fire laces are made from 550 paracord, which adds even more functionality over much weaker standard laces. Misplacing a ferro rod, or any fire starter for that matter, could be your demise in a survival situation. In survival contest shows such as Alone or Naked and Afraid, there are constant examples of contestants having to tap out after losing their fire starter. A ferro rod necklace could have prevented many of these situations. It is simply a ferro rod and striker with a longer cord attached. Usually, ferro rods have a keychain sized cord attached, just to keep the rod and striker together during storage. Stretching this cord out to a lanyard size lets you wear it around your neck. With a place to store it, you are much less likely to misplace the rod by setting it off to the side. Another strong option is simply a holder for the ferro rod. Laced through a belt, a ferro rod holder can give you a place to reliable keep the important survival tool. Most options have the ferro rod holder paired up with a knife sheath, since a knife spine and ferro rods work so well together. Not just for ferro rod scrapers and strikers, but all of the gear we review and put in our own kits. Sometimes, a knife spine will not work or will be more difficult to use based on the blade material and spine shape. Carbide steel blades with a sharp 90 degree spine work much better than a composite blade with a rounded spine. If you have a fixed-blade knife setup that is very durable, you could save some weight by using your knife instead of a dedicated scraper. Ferro rod scrapers usually work very well but provide limited versatility otherwise. If you are using a scraper, try to be sure that it can be used for other applications, like a backup cutting tool or even as a reflector. Hacksaw blades work great and are about as versatile as you can get with these strikers. 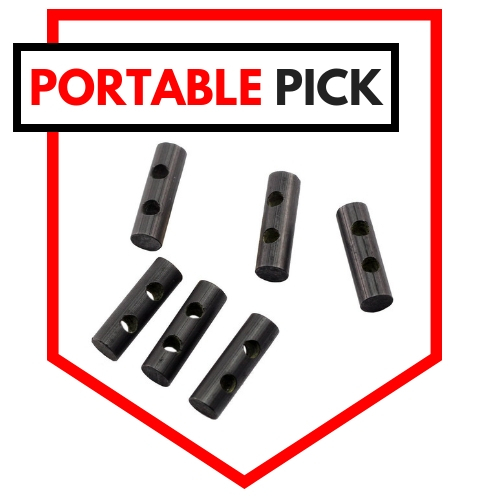 These work especially well with ferro rods stored in kits and bags rather than EDC. Hacksaw blades are a necessary inclusion in most of these kits and striking a ferro rod with one is just one more way they provide versatility. If you carry a carbide knife sharpener anyways, you may not need a ferro rod scraper. Sharpeners are known to give off a good shower of sparks if you strike one against a ferro rod. Even though a good ferro rod will light just about anything flammable with it’s superheated sparks, tinder still should be a consideration. Luckily, you don’t have to be too picky. Dry grass and moss always work well to form a bird’s nest, but keeping some tinder with you is a no-brainer. Sometimes we don’t have the luxury to go picking around the woods or foraging for strips of paper to get a fire started. 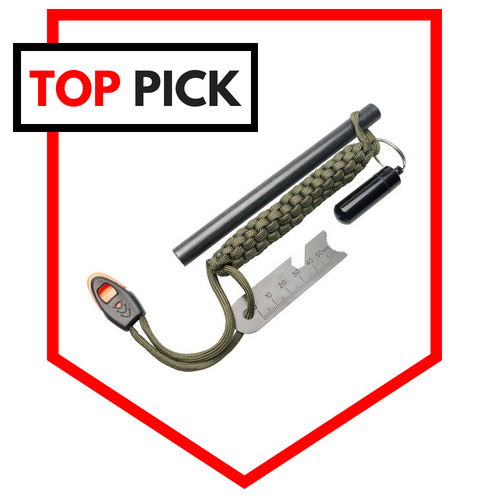 Like we said, though… a ferro rod will light just about any tinder; these just happen to be the best for portability, reliability, and storage. Tape your drill bit to the length you would like to recess the rod into the handle material. Shoot for 1/3 of the total rod length (at least a half inch) to prevent any rod wobble. Drill out the center of the handle material to depth. Using a vice can help. Drop some glue into the new hole and smear just a little onto the ferro rod where it will be recessed. Jam the ferro rod into the handle hole and let the glue dry. Once the handle and rod are dry, give the rod a tug to be sure it is secure. Modifying survival equipment is one great way to get hands-on and familiar with it. Do not just stick your gear in a bag or kit and forget about it. Practice with it. Take it apart and put it back together. Familiarize yourself with your gear and it will pay off in the end. We research products thoroughly before selecting the best products to review. Research into the subject is also conducted, where we consult experts in the field for a better understanding of what makes the gear great. Hours on end are spent field testing gear in practical conditions. We assign performance criteria and impartially rate each tested item. You can support us through our independently chosen links, which earns us a commission at no extra cost to you. After our review process, many of the items reviewed end up in our giveaways, so be sure to check back often. Hirch, Alcan (1920). “Ferrocerium, Its Manufacture and Uses”, Iron Age 106 (Sep.2) Retrieved from Google Books. Survival Hax (2018). How to Start a Fire With a Ferro Rod. Retrieved from SurvivalHax.com. Weert, Alice (1995). The Legend of the Lighter. New York: Abbeville Press, p. 45. Available on Amazon. 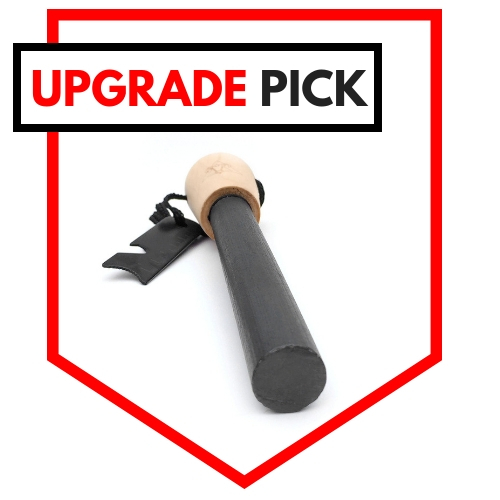 Ferrocerium has been around for over 110 years at this point, and survivalists and preppers are thankful to Carl, the German inventor for taking the time to discover it. 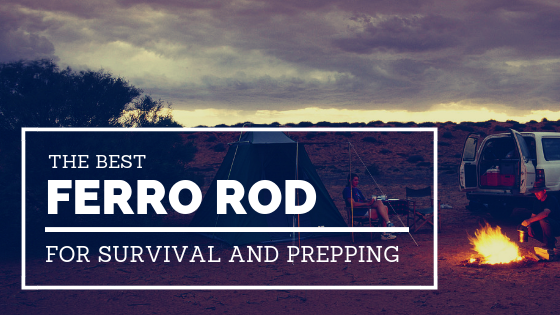 A ferro rod has been a mainstay of survival kits since its usefulness has been demonstrated repeatedly throughout history. We presented quite a lot of information, but as always: if you have any more questions let us know and we would be happy to help. Our research and testing settled on the Survival Hax ferro rod as the best option given the functionality, durability, versatility, and value. We also gave a shout out to a few others as potential upgrade, budget, or portable options. Your specific situation may call for a different solution. Take care of your ferro rod and it will take care of you, providing tens of thousands of sparks to easily start fires in any condition. Pack one confidently, knowing you have the power to stay warm whenever you need to. Be sure to check out the rest of our reviews if you are looking for other excellent gear for your kits. Keep exploring, stay prepared, and be safe.